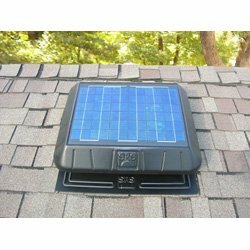 Help lower your energy bills by installing a solar attic fan. Regardless of the time of year, the SunRise solar attic fan can save you up to 30% on your cooling costs. During cold winter months: The heat trapped in your attic can melt the snow that accumulates on your roof, which could then refreeze, leading to destructive and costly ice damming. And all year long: Moisture from everyday activities such as showering and cooking produce water vapor that migrates into the attic, and could lead to mold and mildew. And if it saturates your insulation, it could cause fungal decay and destruction of your roof frame and decking. An attic fan can reduce your energy bills and potential for indoor pollution today! Available with a thermostat, which will turn the fan on at 80 degrees and off at 65 degrees. # Solar Panel: Captures sunlight even on overcast days; designed for optimum efficiency and are extremely weather resistant. # Cover & Base: Molded with UV-stabilized ABS plastic to prevent damage from sunlight. The top shingled appearance helps the unit blend in with the roof while additionally providing stability and strength. # Fan Blade: Specially designed 5-blade, 12" aluminum fan is pitched for maximum air flow, and operates quietly with no harmonic noise. # Stainless Steel Screen: Keeps animals out while allowing maximum air flow. # Mounting Hardware: Stainless steel motor brackets and vertical standoffs provide a flexible and adjustable frame for easy removal or replacement.